The kettlebell has become increasingly more popular due to it's ability to effectively train multiple muscles groups at once. It does this by allowing the user to perform explosive movements that increase strength, endurance, and stability. 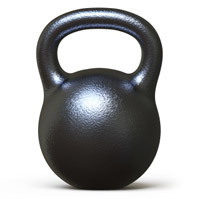 Kettlebells are available in many different weights and sizes. Aside from the varying weight amounts, one of the most important factors to recognize when using a kettlebell is the grip itself. If the grip area is too small, it may cause severe agitation of the hand and can even lead to wrist injury from lack of having a proper grip. Generally made with a metal grip attached to a metal spherical-like structure, the kettlebell can be quite unforgiving in the grip department. With the center of gravity below the handle, the kettlebell allows for swinging or rotational moves to occur much more naturally than using a traditional dumbbell. These kinds of movements involve several different muscle groups and lead to a more intense workout. With several muscle groups firing at once, the calorie burn and aerobic benefit is much greater than performing an exercise that focuses on a single muscle group. Caution should always be taken when performing exercises with kettlebells due to the amount of movement involved within the exercises and the constant shifting of the user's center or gravity.